Hello my friends, I hope you are having a fun summer and enjoying the heat, I love it!! 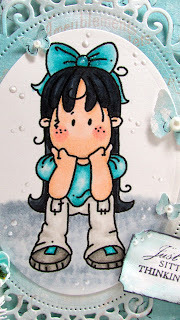 It is a "Cute" Challenge how simple is that and fun to make! I made a paper embellishment for each upper corner of this card. My idea came from Desire from Doing Life. She has been doing these for a while and makes a big variety of them for her cards. Every one has a tutorial. Then I saw them on her scrapbook pages and loved them there too. I asked her if I could use them and she said fine and her instructions were very easy to follow. Each corner has one of this design and this corner I added the Magnolia doohickey cloud to it. I encourage you to go to Desire's Blog and look at all her creativity, amazing and she is sweet as can be! 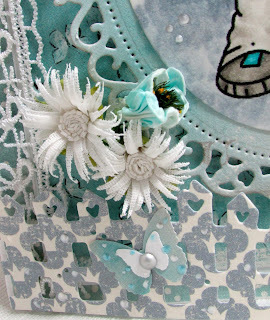 I used a Martha Stewart punch to create the butterflies and also liquid pearls to enhance things on the card. The inside is simple but I have a ton of things going on and couldn't spend too much more time on it. Sometimes I change my inside of cards to suit who they are going to anyway. 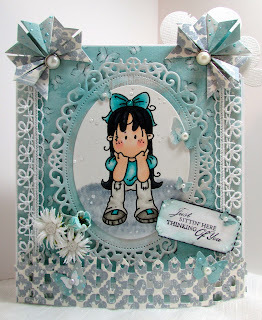 Please check out my team mates over at Divas By Design Challenge Blog today as they are full of awesome ideas!! Have a wonderful day and 4th of July too!! This is so cute Kelly. Love the image and the colour palette you've used. The corner bobs are fantastic and I will have to scoot over to check them out. 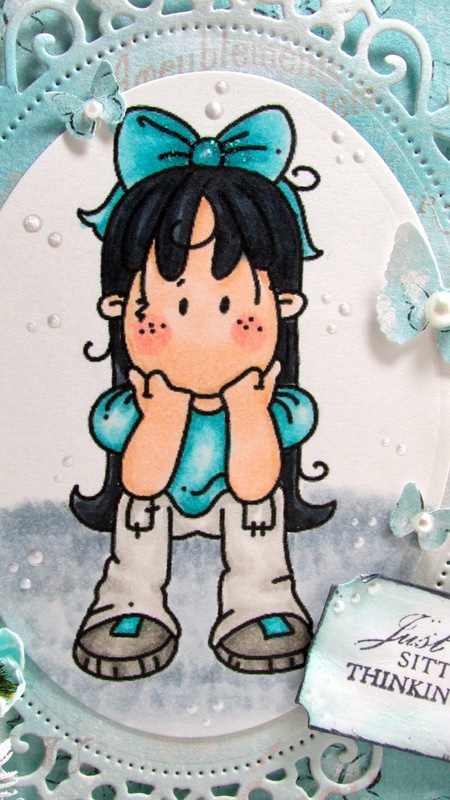 This is as cute as can be...a darling image and the loveliest details. I especially love the corners....gorgeous! Oh love the colors you used ! 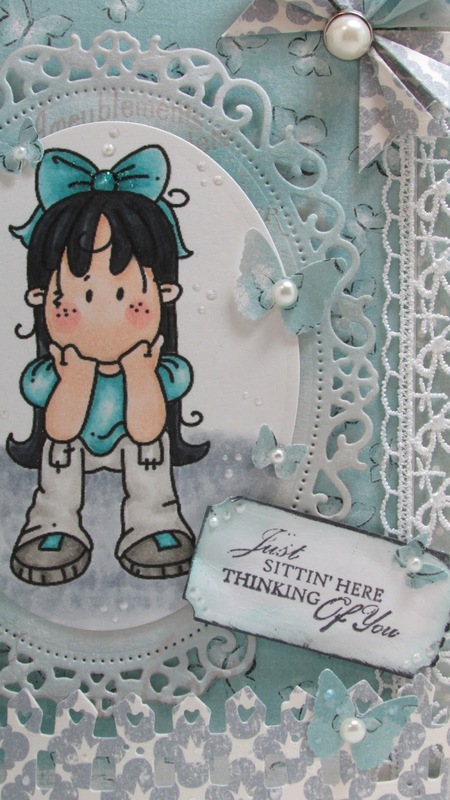 The handmade embellishment is wonderful, this is a superb card ! Beautiful background and wonderful colors Kelly. So well designed!! Your card is beautiful! Love all your elements and colors. 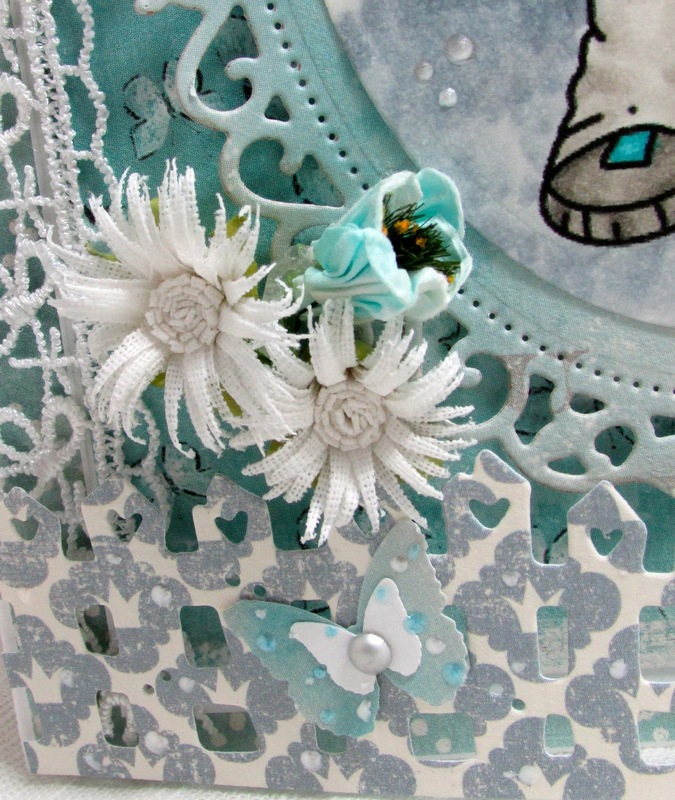 Wow - look at all those die-cuts and laces, and the brilliant origami embellishments... those flowers are so pretty too! Kelly this is beautiful! Love the colors and those corners are awesome! I got to check out the tutorial. Thanks for sharing. As always another fabulous creation! 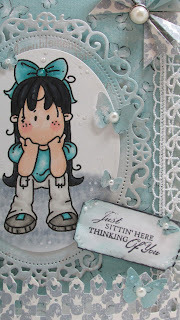 Adorable and so gorgeous Kelly, fabulous details. Beautiful card! I love the teals and grays together and all of the punches and dies you've used.